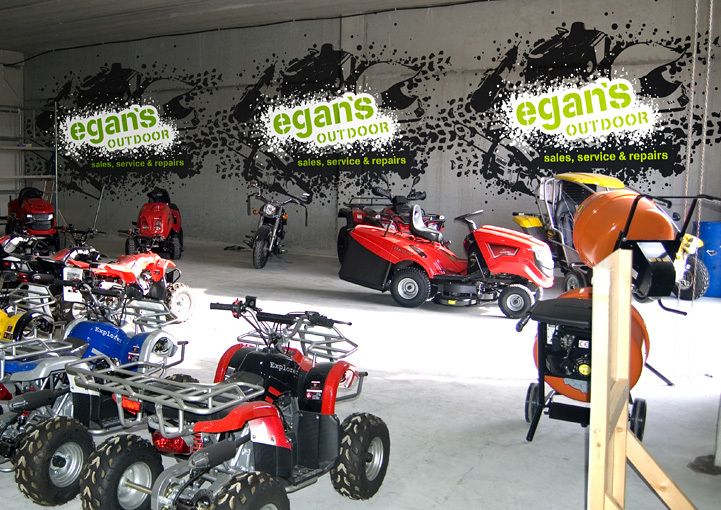 Egan's Outdoor logo design in Claremorris, County Mayo created by the Zetagram graphic design service. 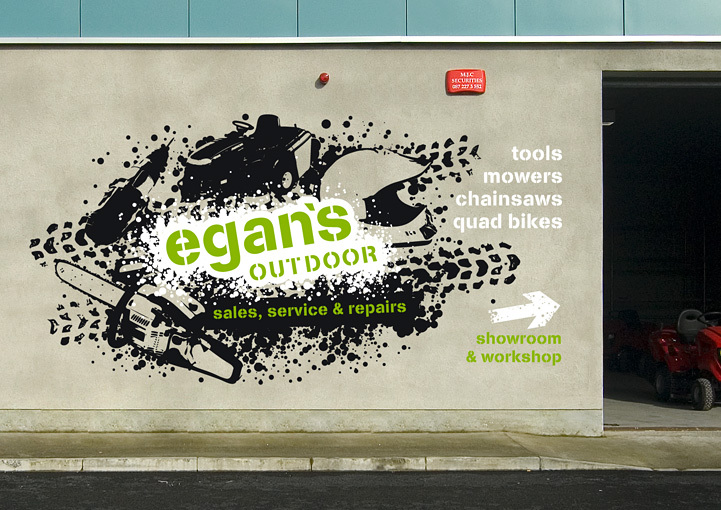 Egan's Outdoor signage design in Claremorris, County Mayo created by the Zetagram sign design service. 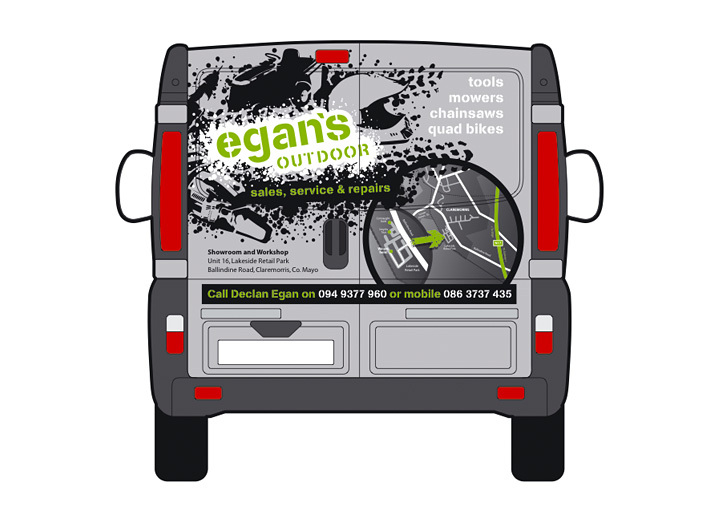 Egan's Outdoor van wrap design in Claremorris, County Mayo created by the Zetagram vehicle graphics design service. 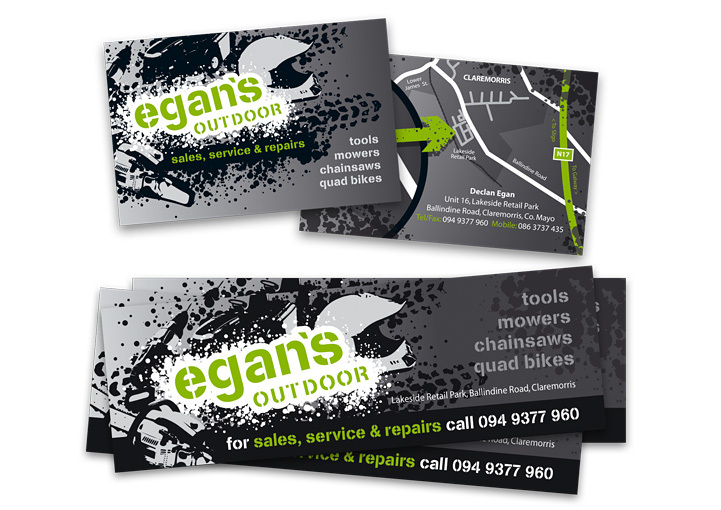 Egan's Outdoor business card design in Claremorris, County Mayo created by the Zetagram stationery design service. 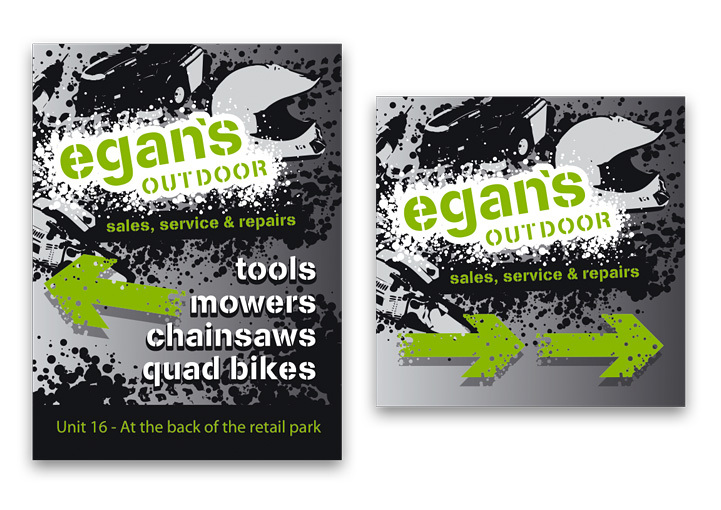 Egan's Outdoor roadside signage design in Claremorris, County Mayo created by the Zetagram sign design service. 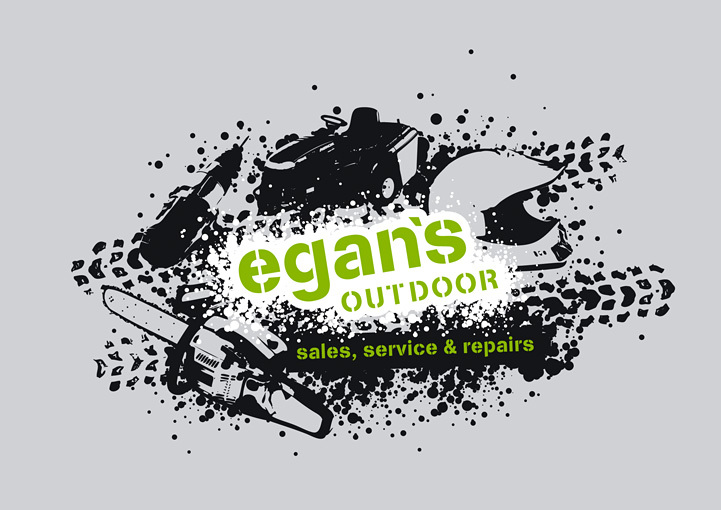 Egan's Outdoor was a small, independent start-up outdoor machinery showroom based in Claremorris, County Mayo, which provided lawnmowers, quad bikes, chainsaws and strimmers for sale and repair. 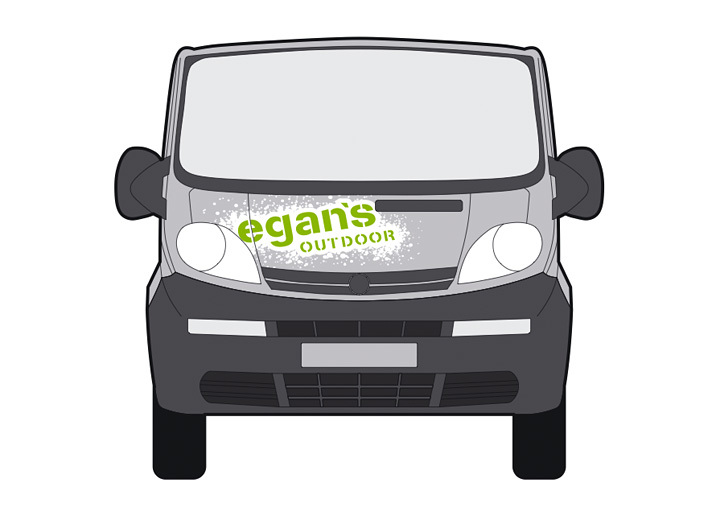 The initial brief to Zetagram* by the client was to create a style to market the business to a local target audience through vehicle graphics and signage due to it's out of the way location. After visiting the new business premises, Zetagram was inspired by the large areas of bare concrete in the workshop/showroom that could be used to promote the products. The most cost-effective method to do this was with sprayed stencil designs, which led to a Banksy style concept for the logo and corporate identity design. 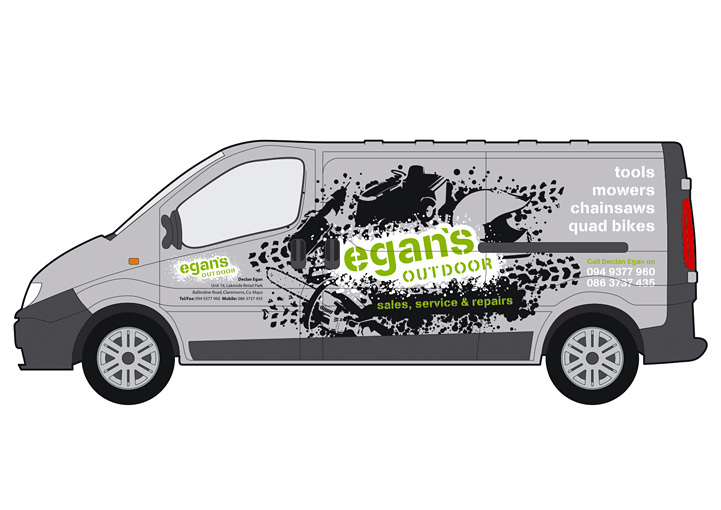 As the client's existing van colour was also silver, Zetagram designed a three colour logo design using standard cut-vinyl colours, with the concrete grey/silver background acting as a base. The design consisted of an arrangement of product illustrations drawn in a stencil/street art style, overlaid with stencilled logotype text created with carefully selected fonts. The resulting unit worked as an enclosed badge that could be applied across the range of marketing material. The logo design arrangement was applied to business cards and stickers, with contact details and custom drawn maps. This style was then further applied to pavement signage and directional signage to attract passing trade from the main road. At the entrance to the workshop/showroom, Zetagram developed the logo design arrangement so it could be router cut from a series of 8x4 sheets, to work as spray stencils against the rendered wall. These durable sheets could then be reused over and over as required, to decorate the rest of the workshop. 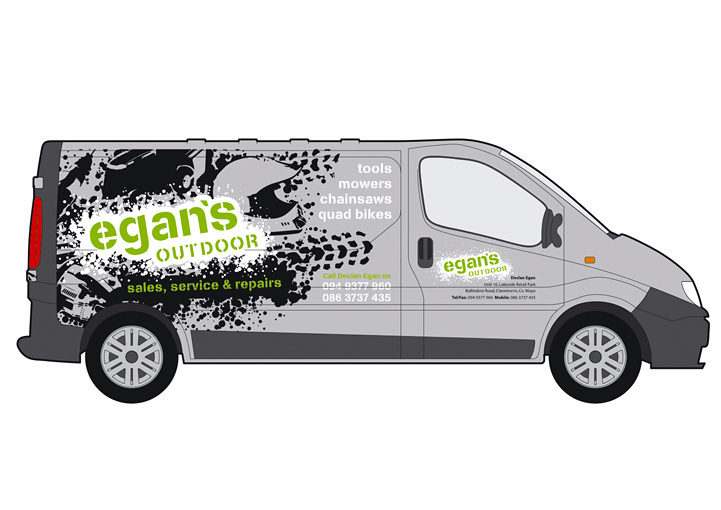 For the van design, the logo arrangement was cut from standard cut-vinyl colours and applied to the sides of the vehicle. Product information and contact details were laid out around this to sit well across panels and doors. On the back of the vehicle there was also an additional inkjet vinyl printed map to highlight the 'off the beaten track' location of the workshop/showroom.